wanted space for kicking a ball, room to grow vegetables and of course the 14ft trampoline. 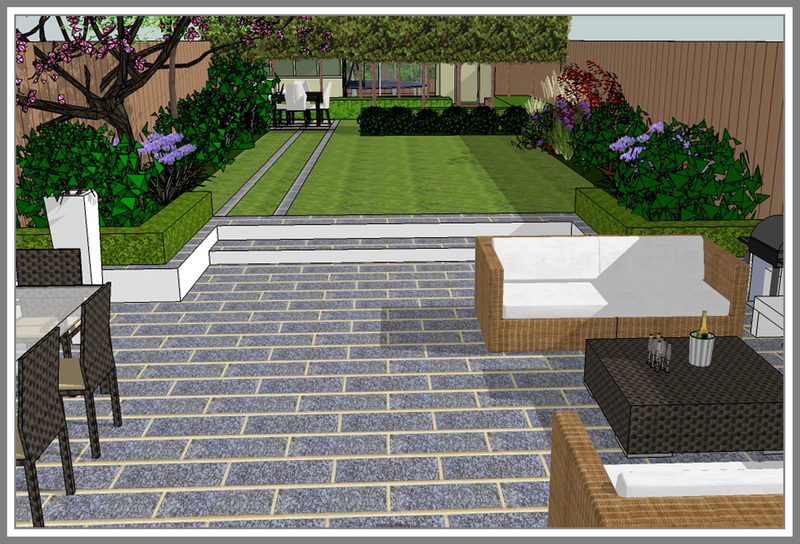 We chose a pale sawn sandstone for the new patio, with recessed LED powered spot lights in the steps and on the floor. The walls are rendered white to keep the look crisp and clean. At the far end of the garden, topiary Laurus Nobilis trees surround a smaller patio. These trees are underplanted with Lavandula 'Richard Gray', Verbena bonariensis 'Lollipop', Stipa tenuissima and Melica cilata to create an ephemeral screen from the rest of the garden, and of course to mask the trampoline. Planting in the borders combined the solid, structural ball shapes of Buxus, Pittosporum and Ballota psuedodictamus with the softer delicate flowers of Anthriscus Sylvestris Ravenswing, Salvia Verticillata 'Smouldering Torches', and Gaura Lindheimeri 'Whirling Butterflies'.